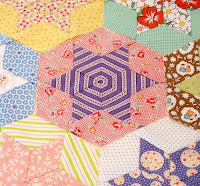 Thank you to all the kind readers who have left such lovely comments on my previous post - hand pieced hexagons by MIL. Jan enjoyed the post and was thrilled to read all your comments, including that she "rocks". She rocks indeed, and I am privileged to have Jan, not only as a mother-in-law and a quilting buddy, but also a friend. There are lots of wonderful things happening at the moment for Red Pepper Quilts - all requiring my time and attention and keeping me absent from my sewing machine. And, do you remember the Stashbuster quilt that I made for my pregnant neighbor? The quilt with the all that pink backing, anticipating a baby girl? Well, it's a girl! Amy, born February 15th, and weighing 7 lbs, and she is such a beautiful baby! And for a little relaxation I have been to my local patchwork store to enjoy the 25% off sale starting today! GJ Discount Fabrics in Lygon Street, East Brunswick, Victoria. Lots of good things there too, and I couldn't resist. If only I had a MIL like Jan! I can't remember whether I've ever commented on your blog, but I came across it a couple of months ago, and everything you make seems to leave me feeling amazed and inspired! I love the colours and prints that you use too. Jan rocks indeed! Nice addition to the stash - might have to visit GJ's tomorrow! it is always nice to hear someone say great things about their mother-in-law. too often MILs are complained about. my MIL is also a wonderful woman who is also a great quilting buddy. it is such a blessing! 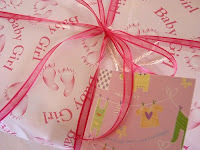 oh dear 20% off at amitie tomorrow and GJs on sale! my credit card will be getting a work out... I think i will be following your lead and getting some of those kei dots while they're slightly closer to within budget! So much to take in for this post! 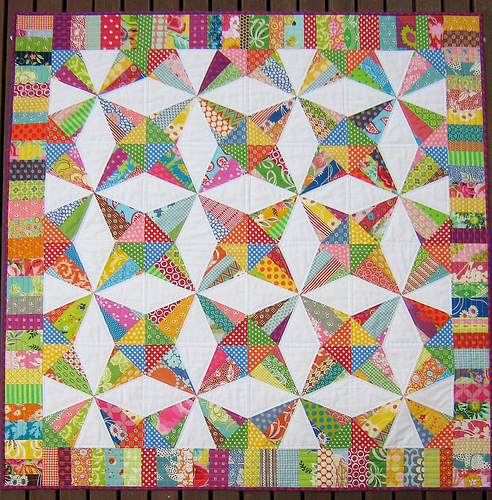 The stashbuster quilt looks beautiful- it's one I aim to make one of these days when I get through all the other things I have in piles all over the place! And yes your MIL does rock. Her stars are just lovely. Looking forward to hearing all the Red Pepper 'news'!! So glad that Jan enjoyed the post. She is definitely well deserving of all the lovely compliments. 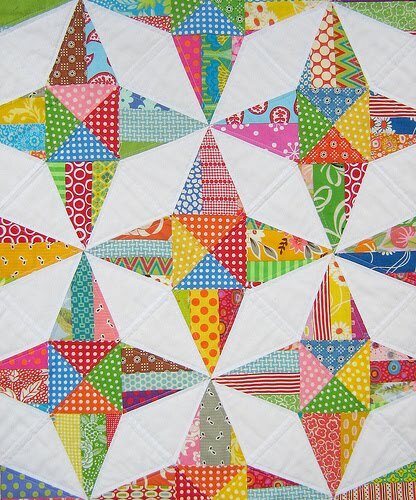 And oh that stashbuster quilt is just wonderful. I am so glad to see it again. They will love it!! Congrats to the new family!! My MIL is not a quilter, but she is nice, too. I so enjoy your blog and seeing the type of fabric you choose. You're a half a world away but make it seem as if you're right next door. Keep up the interesting postings. P.S. Your MIL does Rock!! Hahaha -- I thought you were going to say it was a boy too -- you're too funny! 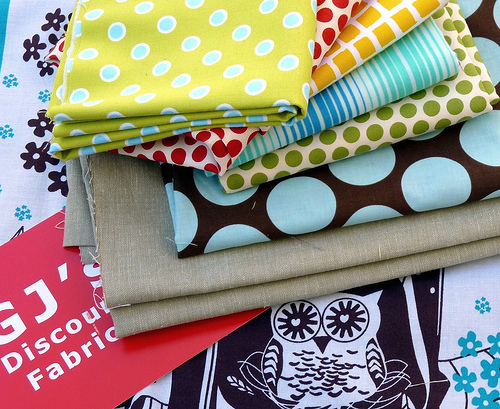 Yummy new fabric -- couldn't be going to a more creative place!!! Haha, I'm with Purple Quilter Queen: I too thought you were going to tell us that they had a boy! Anyway, the quilt is spectacular. She will love it! How fun to be able to quilt with your MIL. Thanks again for all the inspiration. I just love that Stashbuster quilt. Such a great fabric combo... lucky Amy! I just bought that blue dot fabric today! Isn't is cute!? Thanks for letting me know about sew n sell. I'll go and check it out now. Your quilts are lovely - the colours are so fresh and your workmanship is beautiful. Hope there are some bolts left on the shelves for me when I go to GJ's tomorrow.